Worthy cause: Kempsey’s St Paul’s College students who took part in the World’s Greatest Shave, front from left Kiernan Moore, Jordan Ryan, Daniel Baker, James Barron, middle, from left, Caleb Alsford, Ryan Morrison, Daniel Morrison, Josh Needs, back, from left, Nick Irvine, Daniel Saul, Josh Walker, James Conomos, Luke Creighton. FOURTEEN “brave souls” from Kempsey’s St Paul’s College have sacrificed their heads or legs to be shaved or waxed towards curing leukaemia. 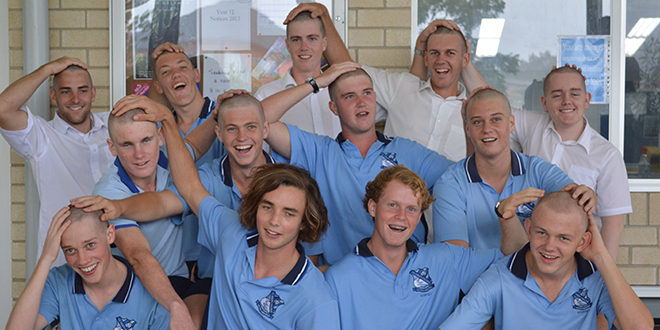 The students were participants in the Leukaemia Foundation’s World’s Greatest Shave at the college on March 21. The event raised more than $4000 for the foundation, which provides practical and emotional support for families of those with blood cancer, as well as investing in research to improve treatments and find cures. Principal Kevin Lewis said the fact St Paul’s had been touched by cancer in recent years made the college’s participation “even more fitting”. The shaving rights for each head were auctioned off after some intense bidding from teachers, students and family. The 14 participants were Ian Bool, Caled Alsford, Kiernan Moore, James Barron, Luke Creighton, Josh Martin, Ryan Morrison, Daniel Morrison, James Conomos, Josh Walker, Jordan Ryan, Daniel Saul, Josh Needs and Nick Irvine. “We had 14 brave souls from Years 11 and 12 put their heads or legs to be shaved or waxed, with the team raising over $4000 for the cause,” Mr Lewis said.